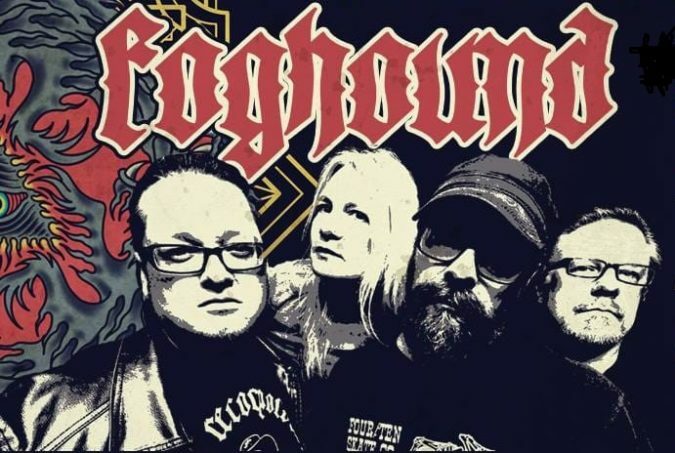 Baltimore, Maryland’s FOGHOUND have had one hell of a year. Today we have a première of FOGHOUND‘s new video for their song “Filthy“, off their new album ‘Awaken To Destroy‘, coming out on November 23rd, via Ripple Music. From the first crushing riffs of the title track “Awaken To Destroy,” the uptempo thrashers “Known Wolves” and “Cut The Cord,” the stomping, bulldozer rhythms of “Filthy” and “Keep On Shoveling,” to the somber classic doom and southern tinged “Staring Down The Demons“, and on to the fleeting and fading notes of the closer “Death Will Tremble“, FOGHOUND‘s latest offering has a story to tell. The story in ‘Awaken To Destroy‘ has almost as many twists and turns, triumphs and tragedies, challenges, and ultimately inspirational moments as the making of the record itself was for the band. ‘Awaken To Destroy‘ had begun recording in fits and starts in early November 2016, as the follow-up to ‘The World Unseen‘ (via Ripple Music). The band in 2016 – Chuck Dukehart (Drums, Vocals), Bob Sipes (Lead Guitars, Vocals), Dee Settar (Guitars, Keys, Vocals), and Rev. Jim Forrester (Bass, Vocals) – set about capturing the first batch of songs with Frank Marchand (The Obsessed, Borracho) at Waterford Digital Studio outside Baltimore, Maryland. As personal and professional commitments sidelined production into the following year, things took a turn for the worse. Medical issues forced bassist Rev. Jim Forrester into the hospital, and ultimately a medically induced coma, in the spring of 2017. With the future uncertain, Jim pulled through and improved in dramatic fashion, quite literally just in time to perform with he and drummer Chuck Dukehart’s other project Serpents of Secrecy at 2017’s Maryland Doom Fest. With writing and rehearsals ramping up again in the fall of 2017, the band went back into the studio intermittently to resume work on the album. The song “Keep On Shoveling” was inspired by Jim’s battle in the hospital with themes of perseverance and triumph in the face of adversity coming to the forefront. It was only natural that Jim would handle the spoken word section of the breakdown and add backing vocals to the choruses. It was first released in January 2018, as a benefit single by Ripple Music (streaming below). Just as things seemed to be progressing in the right direction, once again life had a lesson to teach about nothing ever being promised. The evening after playing for a holiday party at the Baltimore Tattoo Museum, and what would turn out to be his final performance with the band, Jim was gunned down outside of his work in an apparent robbery attempt gone wrong. After taking time to collectively mourn the loss of their fallen brother, regroup and reassess priorities, and after much input from trusted friends and family, the decision was made that Jim would never want the project to lay unfinished and that the Foghound show must go on. With heavy hearts, Foghound once again headed back to the studio to wrap up the album in the spring of 2018. With a renewed focus, the new album began to take on a shape of its own. With lyrics touching upon the tragedies the group had endured, they took a more personal tone, with songs “Death Will Tremble” and “In Due Time…“, as well as the addition of “Ave!” – a somber, instrumental tune stemming from a bedroom demo that Jim had recorded on an acoustic guitar and sent to the band as a possible future song idea. On “Ave!“, Jim’s original performance was kept intact, with just the addition of Hammond organ flourishes (by Dee Settar) adding an element of mournfulness that spoke not just to the emotions everyone felt in that room, but to the loss felt by so many. The album closing “Death Will Tremble” took shape during these final studio sessions, as well. It was originally tracked as an off-the-cuff, improvisational warm up jam during the original first few recording sessions, with the intention to possibly cut into segue passages between tracks. The decision was made to instead flesh it out in order to highlight Jim’s signature bass style and display the unspoken interplay between the musicians that spent so much time playing together so well. With the addition of lyrics inspired by a Bukowski quote that Jim personally held dear, from memorial cards printed for the funeral services, as well as Chuck Dukehart’s own second verse – the song took on a new form as a tribute to the man himself, his playing, and the fleeting nature of life on this mortal coil. With primary tracking completed, additional keyboard layers were added courtesy of Bob’s son Nick Sipes. New Foghound family member Adam Heinzmann (Internal Void) came on board, in time to add additional backing vocals to a few tracks before the album was ready to mix and then finally off to Alan Douches at West West Side Music for mastering. With the final touches of stunning front and back cover artwork by artist Ben Proudman, the outstanding skills of photographer Shane K. Gardner, and graphic design ninja Bill Kole pulling the whole thing together, this labor of love and sleeping giant that is “Awaken To Destroy” is ready to do just that. Awaken. To. Destroy. The new FOGHOUND full-length album, “Awaken To Destroy” is set for release on November 23rd, and will be available worldwide on CD, Vinyl/Limited Color Vinyl, and digital download/stream via Ripple Music. Find more details about Foghound’s album release show and ‘Awaken To Destroy‘ beer release below the video premiere for the new track “Filthy“.